One of the biggest online retailers on the planet, Amazon is looking to creep into the burgeoning Southeast Asian e-commerce market. According to a TechCrunch report in November 2016, Amazon have been covertly buying assets and making new hires in the region. The report mentioned that Amazon’s plans in the region are led by Steven Scrive, head of Business Development in ASEAN. Singapore witnessed their first move into the region last year with the launch of Amazon Prime in the country. The launch was described by American tech website Mashable as the “…biggest Amazon Prime Now launch ever”. Amazon Prime Now is a delivery service that is part of the Amazon Prime paid membership where customers receive their items within two hours after placing an order on the website. Mashable reported that so many people tried Amazon Prime Now during the launch that Amazon had to use Ubers and taxis to deliver their items. The recent launch by Amazon shows that they are trying to capture the Asian market, having already dominated the Western one. Amazon are currently focusing their strengths on India, who are one of their biggest non-western markets. Indian business website, LiveMint reported that Amazon India has doubled their authorised capital to US$4.7 billion. Amazon has also recently launched in Australia. A report by Temasek and Google from 2017 shows that the digital economy in the region is expected to grow to US$200 billion within the decade. The report also highlighted that there are about 260 million internet users in the region and this number is expected to grow to 480 million by 2020, making Southeast Asia the fourth largest internet market in the world. 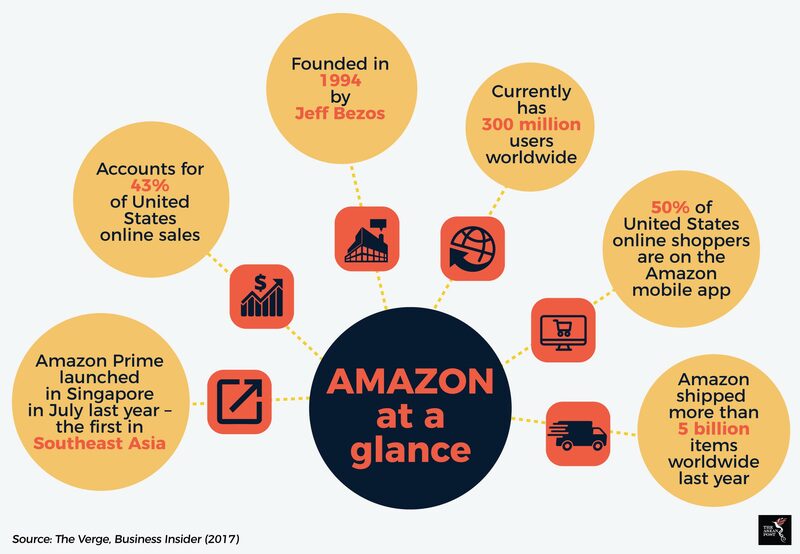 With such a huge market, it is no wonder Amazon are making moves into the region. However, analysts have questioned Amazon’s launch in Singapore – begging the question, have they moved in too late? Amazon are entering into an established e-commerce market with certain players already dominating the field. They’ll also have an uphill battle against Chinese e-commerce superpower, Alibaba. Alibaba announced a US$1 billion deal with Lazada in June 2017 to raise its stake in the e-commerce company from 51% to 83%, effectively making Jack Ma the owner of Lazada. Lazada is a Southeast Asian e-commerce firm founded by Rocket Internet, a German e-commerce company, in 2011. Lazada currently operates in Indonesia, Malaysia, Philippines, Singapore, Thailand and Vietnam. According to an article from August 2017 in the Nikkei Asian Review, Lazada is the biggest e-commerce company in the region. Anticipating Amazon’s launch in the region last year, Lazada made moves to counter their influence here. TechCrunch reported in April 2017 that Lazada teamed up with Uber and Netflix to launch LiveUp. LiveUp is a paid membership system where subscribers can get exclusive deals from all three companies. Aside from that, if Amazon wishes to expand its markets in the region outside of Singapore, they will face stiff competition from local consumer-to-consumer websites too. As opposed to Lazada where businesses sell to consumers, consumer-to-consumer websites are online marketplaces where individuals buy or trade items. According to a Frost and Sullivan report in May 2017, Shoppee has an annualized gross merchandise value exceeding US$3 billion in seven markets in Southeast Asia. Carousell is another big player in the consumer-to-consumer market. The Singapore-based startup recently closed a Series C round of fundraising worth US$70-US$80 million. Amazon could have a tough time cracking the Asian market. According to Singaporean website Today Online, the reception for Amazon in Singapore has been underwhelming. The article published in December 2017 points out that one of the particular complaints received was that some items aren’t available on the Amazon website. Compare this to Lazada, who according to a Bloomberg report in October 2017, offers more than 30 million products as opposed to the tens of thousands available via Amazon Prime Now. Another possible factor Amazon could have a tough time cracking the local market is that the website can be too catered to Western consumer habits. For example, with digital wallets rising in the region, Lazada allows consumers to pay with Alipay. Also, Amazon requires having a credit card or a bank account to buy from them. Considering that a majority of Southeast Asians do not have bank accounts (KPMG reported in 2016 that only 27% of Southeast Asia’s population have a bank account), customers would be hard to come by for Amazon. Companies such as Lazada and Carousell among others, have a cash on delivery option where buyers can pay in cash for their items. If Amazon is intent on challenging the likes of Alibaba in the region, they really need to step up their game. Amazon has to consider that the market and trends in this region are different from those in America or Europe. Amazon has to cater to these differences and shake up their business model if they want to enjoy the same success that they are currently enjoying in other parts of the world.